Golden Gate K9's Explosives Detection Dog Training meets and exceeds California Peace Officer Standards and Training (P.O.S.T.) Guidelines, California Narcotic Canine Association (CNCA) Certification Standards, and Scientific Working Group on Dog and Orthogonal detector Guidelines (SWGDOG). Course includes a CNCA Certification by a Disinterested Certification Official. 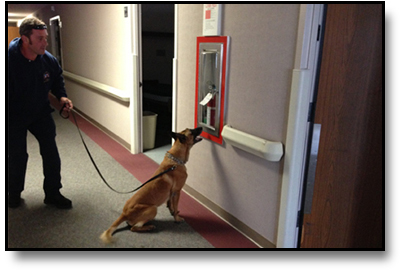 Golden Gate K9's Explosive Detection Dog Training is a 7-week course for 8 odors. Additional odors are available upon request. Agency chooses additional odors. Our Course's desire is Protect Lives, Protect National Land Marks, and to Protect Property through Proper K9 Selection, Training, and Deployment of Our Explosive Detection Dog Teams. In Golden Gate K9's Explosive Detection Dog Course, the K9 learns how to safely and systematically hunt while the handler facilitates the search of the environment being sniffed by the K9. An Explosive Detection Dog's hunt is different from those of other detection dogs. The selection, training, and handler's facilitation of the search pattern are critical to the preservation of human life and property. Golden Gate K9 takes special care in the selection and training of our Explosive Detector Dog Teams. Golden Gate K9 Explosive Detection Dog Services provide a strong visible and psychological deterrent against criminal and terrorist threats. Our Explosive Detection Dogs are trained to detect a variety of explosive materials. Our Explosive Detector Dog Teams are deployed for missions to include but are not limited to: Bomb Threat Responses, Venue Sweeps, Building Sweeps, Office Sweeps, Vehicle Sweeps, Arear Sweeps, Cargo Sweeps, Luggage/Container Sweeps, and Sweeps for VIP related details.